So it wasn’t a big surprise that players on Team World were pretty good at the Women’s Team Scramble, a new wrinkle added to this year’s schedule at the Orleans Arena in Las Vegas. Team World, which dominated the first two days of the competition, continued to bully its opponents, taking 2.5 out of the three points available in Women’s Team Scramble events Saturday morning and stretch its lead in the chase for the Cup to 16-5. It will take a minimum of 30.5 points to clinch the championship when the event closes Sunday. Team Scramble and Mixed Team Scramble events put an emphasis on how curlers can perform with teammates they’d regularly play as opponents. In the Team Scramble, men’s and women’s teams are mixed to form new same-gender lineups. However, front-end and back-end teammates cannot be on the same lineup. 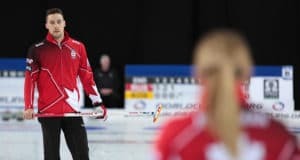 “Oh, my, God — that was so much fun,” said Team World’s Anna Hasselborg who skipped her ‘new’ lineup of third Jennifer Dodds, second Agnes Knochenhauer and lead Lauren Gray to a 6-5 victory over Team North America’s Rachel Homan of Ottawa. Hasselborg, the 2018 women’s Olympic gold-medallist from Stockholm, admitted her team was a bit nervous having to use English to communicate on the ice with Dodds and Gray, the two Scots on her team, but things worked out beautifully. Team World skip Silvana Tirinzoni of Switzerland also enjoyed the novelty of playing with curlers she normally competes against. “That was so much fun,” said Tirinzoni, who guided her team of third Sara McManus, second Esther Neuenschwander and lead Sofia Mabergs to a decisive 8-3 victory over U.S. skip Jamie Sinclair and her Team North America. Tirinzoni said she had never played with McManus and Mabergs, a pair of Swedes who normally play wth Hasselborg. Team North America could only manage a half-point and it took some doing to get it. Skip Jennifer Jones from Shanty Bay, Ont., the 2014 women’s Olympic gold-medallist, missed a couple of key shots early to fall behind 4-1, but rallied to earn a 6-6 tie with Scottish skip Eve Muirhead’s Team World lineup of third Alina Pätz, second Vicki Chalmers and lead Melanie Barbezat. 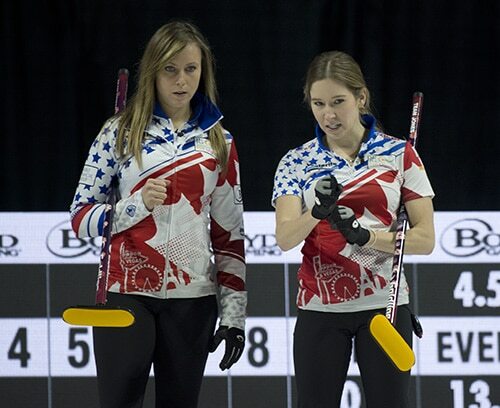 Jones, who was supported by third Sarah Anderson, Jocelyn Peterman (Calgary) and Monica Walker, needed a three-ender on the final end to earn the half-point. Team World’s dominance in the Women’s Scramble was just more of the same this week as it continues to batter the North Americans at every turn. Team World won eight of the 12 mixed doubles games and pocketed 5.5 out of the six points available in the team competitions. How much more dominant can you get? It’s also moved Team World tantalizingly close to the finish line. Two more good performances in today’s afternoon Men’s Scramble and tonight’s Mixed Team Play and Team World can start thinking about a victory banquet Sunday night. There are still nine points on the table in today’s remaining two draws (tonight’s mixed games are worth two points per win), and Team North America will need to win most of them just to stay close, then hope it can put things together in Sunday’s Skins format. 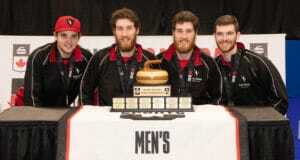 “Just too many zeros on the board for us,” said Team North America coach Jeff Stoughton. “It’s just been missing a half-shot here and a full shot there. Hats off to the Worlds, they’ve been capitalizing on our mistakes. Action resumes this afternoon at 1:30 p.m. (PST) with the Men’s Team Scramble and tonight at 6:30 p.m. with Mixed Team Play. 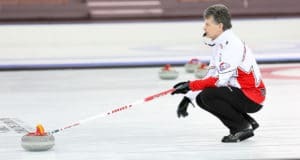 The World Financial Group Continental Cup format pits Team North America against Team World in a series of Team Play, Mixed Doubles, Team Scramble, Mixed Team Play and Skins games.